Hopefully by now you&apos;ve taken advantage of the Visit Salt Lake Connect Pass, which features 13 of Salt Lake&apos;s best attractions at a better-than-reasonable price. We&apos;ve already written about a few of those attractions on the Visit Salt Lake blog (Thanksgiving Point Children&apos;s Discovery Garden, Lion House Pantry, Red Butte Gardens to name a few) but we have yet to write about Snowbird Ski & Summer Resort. Snowbird has so much to offer. 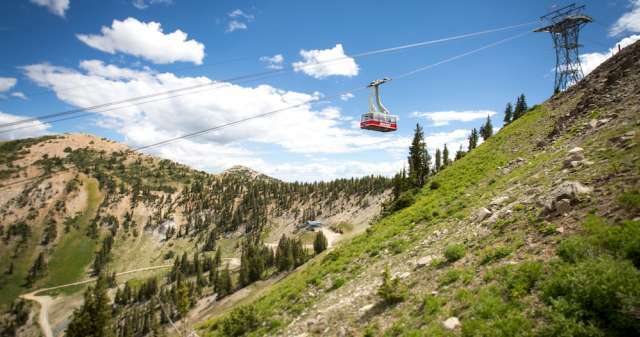 You&apos;ll find a variety of summer activities like an Alpine slide, aerial tram ride (cost of the tram ride is included with the Visit Salt Lake Connect Pass,) zip rider, ropes course and even a mechanical bull! And, of course there&apos;s no better time to showcase Snowbird than during September when Oktoberfest is in full swing! In the winter you&apos;ll find award-winning ski runs, snowmobile tours, snow shoeing, fly fishing and even heli-skiing. If you&apos;re visiting from out of town, Snowbird has quite a few vacation and recreation packages with some great deals for both summer and winter. Who knew such a treasure existed in our own backyard? And not just in winter! Read more about Snowbird Ski & Summer Resort, including the resort&apos;s history, on its website. You can read more about Emily and her love of shopping local vendors—or any vendors for that matter—on isthisREALLYmylife.com.